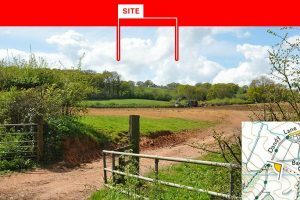 The site covers an area of 0.77 hectares, of which 0.66ha will remain undeveloped and improved for landscape and biodiversity purposes. The design of the building group makes good use of the sloping topography that typifies this landscape, in so doing the development sits low on the site hugging the hillside and does not protrude into the skyline. Combined with its single storey split form of two linked wings, where a significat part of the building is hidden from external views, particularly so to the sensitive northern receptors. The northern wing forms a new feature, which is characterised by quadrilateral sculptured shapes which breaks up the building mass, and importantly obscures large expanses of glazing. The facade is clad in charcoal metallic material which is recessive and has low visual impact, allowing the building to blend with the backdrop of trees along the hill ridge. The building is further integrated into the landscape through a combination of ‘shard’ sculptural elements that reflect the building facade and low ‘naturalised’ groups of tufted grasses to blur the distinction between the built and soft forms. The garden, situated largely to the south of the building hides the domestic activities associated with the residential use of the site, thus allowing for a large portion of the site to be retained as open meadow (including the roofs of the structures), thus maintaining the appearance of a rural landscape and reducing loss of grassland, whist increasing diversity with a species rich sward. The copse planting to the south west corner of the site reinforces the tree line ridge that is characteristic of the area, yet gappy in the location of the site, and will over time screen the neighbouring large 20th century residential property known as Oceania, which currently has a detracting presence on the landscape when viewed from the north. The existing site plan illustrates boundaries, topography and immediate surrounding dwellings and buildings. A sectional illustration of the landscape analyses the existing site conditions. Immediate setting and characteristics. The site is indicated with a red outline. The domestication of the existing ridge illustrates a varying degree of uses ranging from domestic to farmstead with both single and two storey elements. Entrances in the vicinity are also indicated. Hux Shard site immediate setting and characteristics. The populated ridge can be clearly seen and identified fom this viewpoint. Populated ridge with contrast to indicate structures. 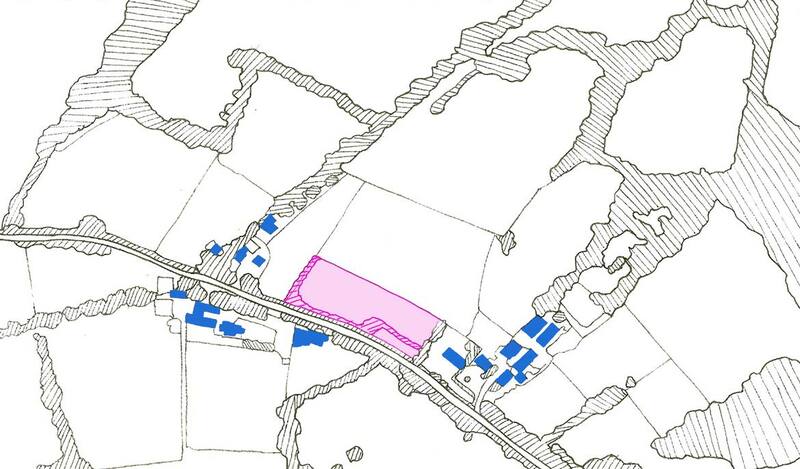 The settlement pattern at a macro scale is a loose cluster of settlement off both sides of Church Hill Road. Development as proposed on the site would consolidate that cluster, but would not significantly intensify settlement on the ridge, due to the generous open space surrounding the new building. Existing field pattern with settlement. Proposed field pattern with settlement and proposed dwelling. Looking at a micro level, the settlement is of three loose groups, with a large single dwelling (Oceania) immediately to the south of our site. The new dwelling at Huxham View creates a relationship with Oceania. Visually, the settlement appears as a linear development along the ridge line. Development on the site would be a continuation of this pattern. 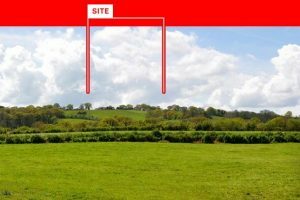 The division of the single filed into two parcels to create the development site would have a minor effect on the existing field pattern and scale, which would be in keeping with the local landscape of small to medium scale. Essentially a medium size field will be divided into a small field of irregular forms. Various viewpoints are presented here indicating the approximate position of the site and its association with the landscape. Each image is accompanied with an OS plan view indicating viewpoint direction (not to scale). Viewpoint 03: Dandy Lane. Vista view to the sites lower northern portion. Neighbouring property to the west is preset within the view. Other parts of the site are screened or heavily filtered by intervening vegetation. Viewpoint 04: Public Road Pynes Lodge. Direct view to the site in elevated position. 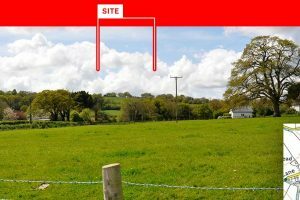 Neighbouing properties are present to either side of the site and directly behind. Viewpoint 05: Public Road. Direct and open view to the site in elevated position. Neighbouing properties are present to either side of the site and directly behind. Viewpoint 06: Public Road near Higher Lathy Farm. Direct and open view to the site in elevated position. Neighbouing properties are present to either side of the site and directly behind. Viewpoint 07: Public Footpath near Higher Lathy Farm. Direct and open view to the site in elevated position. 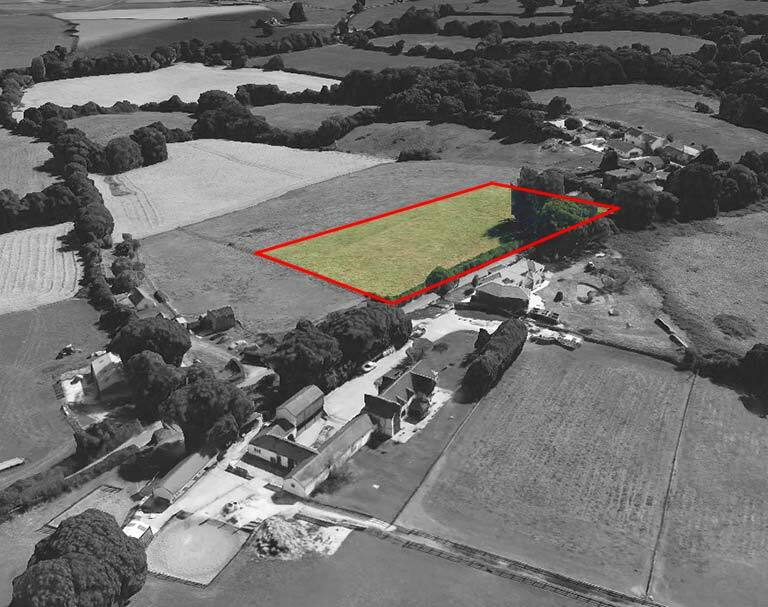 Neighbouing properties are present to either side of the site and directly behind. Viewpoint 08: Public Road near Rosemead. Vista view to site where the majority of the field is visible towards the brow of the hill. Site within the setting of a listed building (Rosemead). Existing development is noticeable close to the site. Mature trees form a backdrop to the site, with considerable trees in the vicinity of the site. Viewpoint 09: Poltimore Public Road. 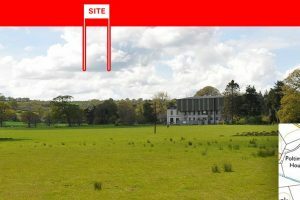 Site in distant elevated position, screened by trees within Politmore Park. Some filtered views may exist during the winter months. Viewpoint 10: Site located in a distant elevated position, screened from view by vegetation along edge of bridleway. 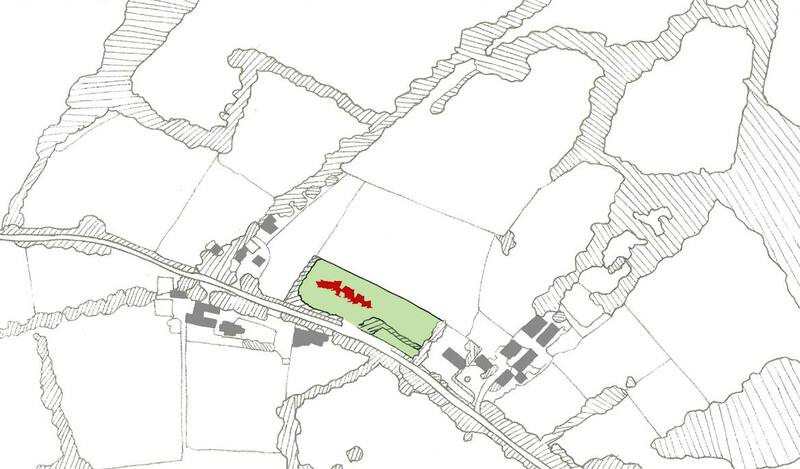 A Landscape and Visual Impact Assessment (LVIA) was produced in the very early stages of the design by the landscape architects, Redbay Design. The images here are best viewed on desktop due to their detail and complexity. 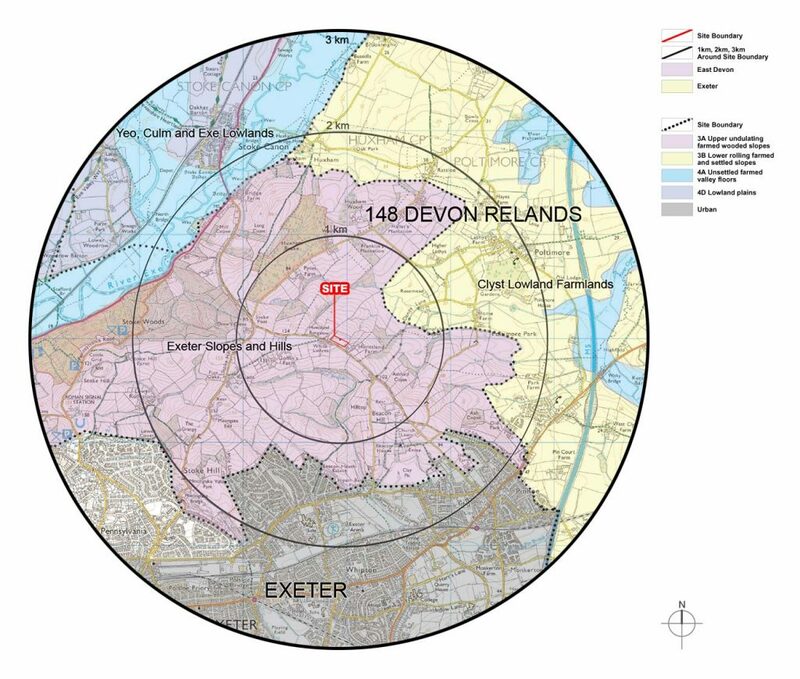 Hux Shard district boundaries, East Devon and Exeter. Hux Shard landscape character including upper farmed wooded slopes, lower rolling farmed and settled slopes, unsettled farmed valley floors, lowland plains and urban areas. Hux Shard proximity to green wedge, scheduled ancient monuments (within 3km study area) and listed buildings (relevant to assessment). This drawing is based upon computer generated Zone of Theoretical Visibility (ZTV) studies. The areas shown are the maximum theoretical visibility, taking into account topography only. Download a PDF image of the Hux Shard district boundaries, East Devon and Exeter. Download a PDF image of the Hux Shard landscape character. Download a PDF image of the Hux Shard proximity to green wedge, ancient monuments and listed Buildings. Download a PDF image of the Hux Shard viewpoints and zones of theoretical visibility. 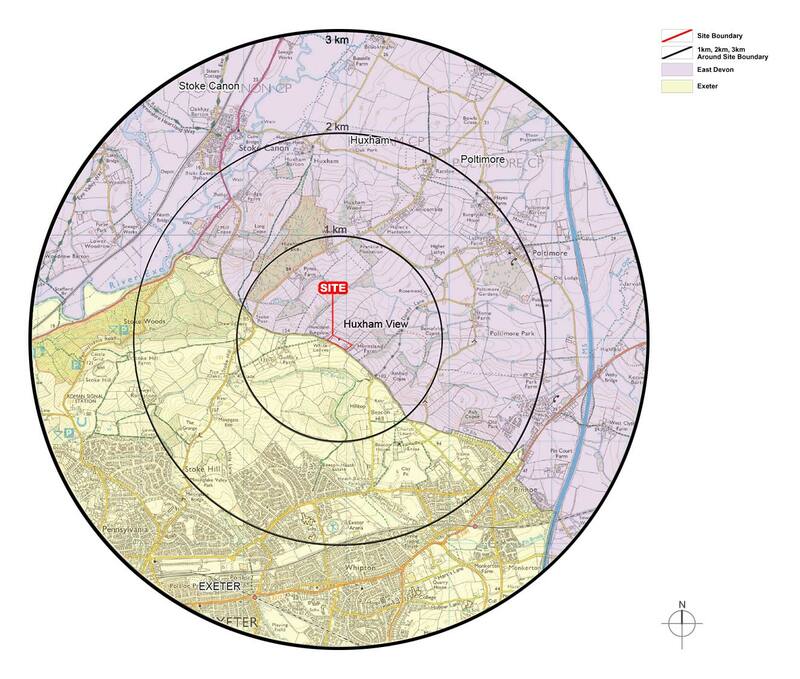 Overall the site and local landscape has a medium sensitivity to the type of development proposed. 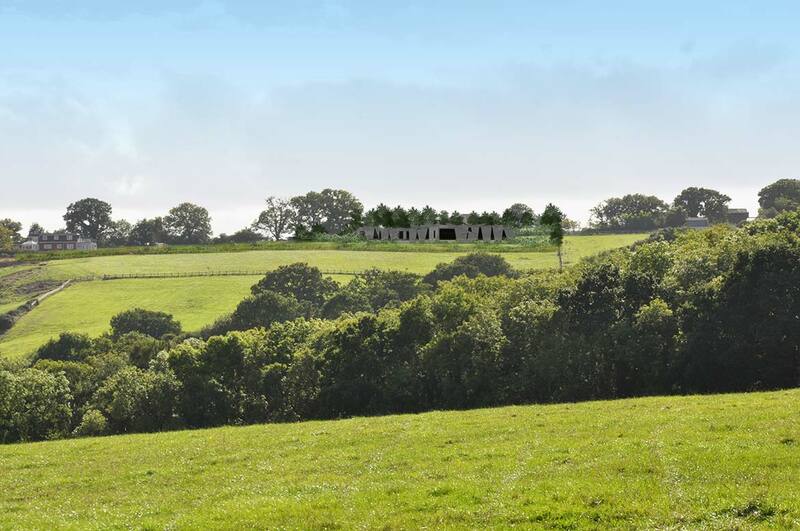 This is primarily due to the site’s open elevated position on a prominent hillside within open countryside. However, there are residential dwellings either side of the site and to the south on the opposite side of the road, forming a linear thread of settlement along the ridge, so buildings within the immediate locality are not out of place. With appropriate development on site new buildings could form a loose cluster with those existing buildings. 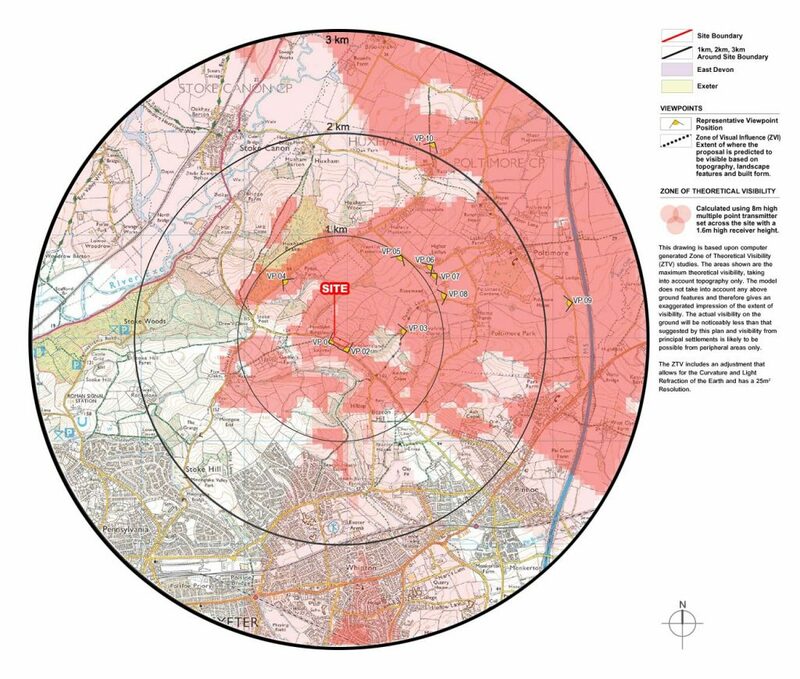 None of the landscape within the study area is designated i.e Area of Outstanding Natural Beauty (AONB) or Area of Great Landscape Value (AGLV). 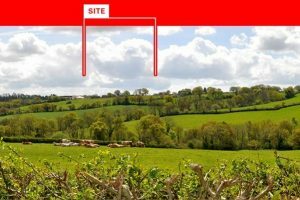 The physical landscape elements that could be effected include changes to the land-form to accommodate the buildings being set into the slope and the loss of semi improved grazing land (currently out of production) across the site. 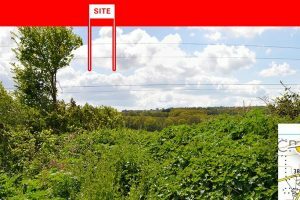 No significant trees are to be affected by the development as none exist on the site. 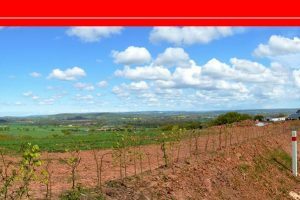 There is good potential for landscape enhancements with the reintroduction of hedgerows where there is currently post and rail fencing which is prevalent around the site. Such new hedges with trees would fit well with the framework of hedges of the local landscape and provide assimilation of the new buildings. Division of the plots with hedgerows could form linear parcels that would mimic the medieval fields to be found in the vicinity. 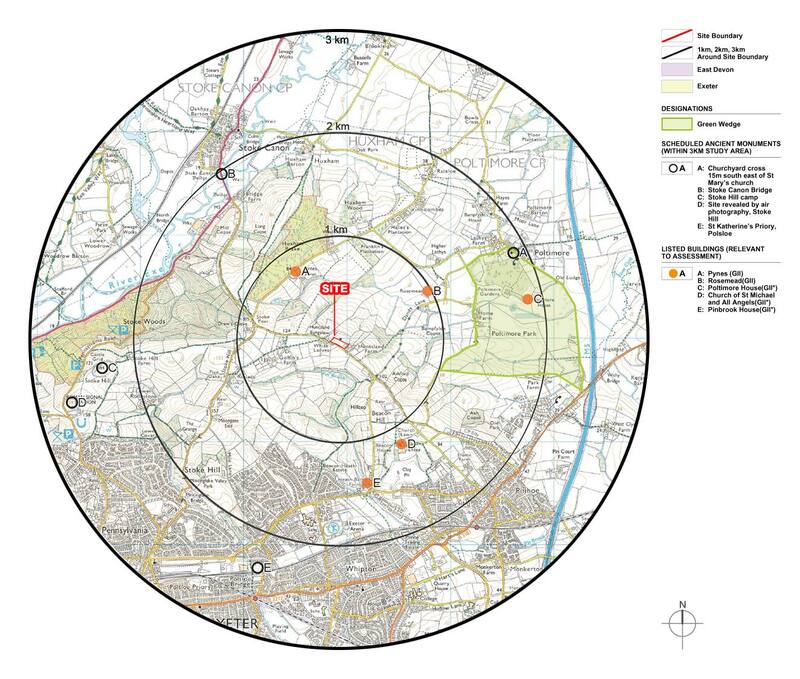 Effects to visual amenity will be to local roads and Public Rights of Way (PRoW) to the North West through to the north east and immediately to the south. The sensitivity in visual amenity terms is medium, there is some screening afforded by vegetation in the local landscape. There are also framed views to the site, where the site is in an elevated position. Development proposals will need to be carefully considered so as not to appear overly dominant, close to the ridge-line. This could perhaps be achieved by creating a feature building with any further buildings being recessive and appearing smaller when viewed from locations to the north through design of form and massing, such as single story. The buildings could be designed to appear as a building group possibly out houses to the main house and use recessive cladding. Material finishes would be expected to include those of local vernacular: stone, and or slate. The use of grass roof’s would reduce the loss of grassland and aid assimilation into the site. The ecological assessment has examined the habitats and species of interest within the site and surrounding area. 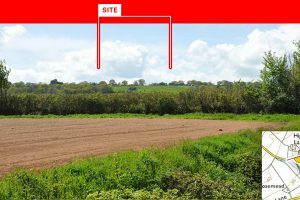 The site is not covered by, or immediately adjacent to, any statutory or non-statutory designated sites of biodiversity value. However, there is one Site of Special Scientific Interest (Stoke Woodland SSSI) located approximately 1km to the west of the site, and five county wildlife sites and two unconfirmed wildlife sites within 1km of the site. 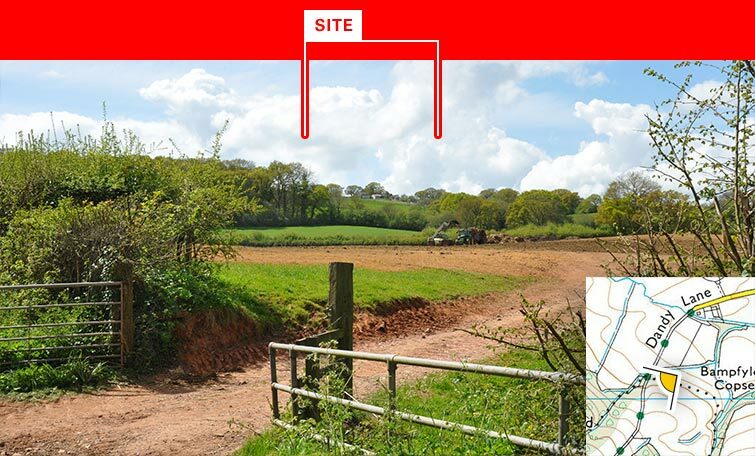 Ecological mitigation and enhancements have been designed to mitigate for construction and operation phase disturbance and for the loss of 7,700m2 of semi-improved grassland and to increase the value of the site. 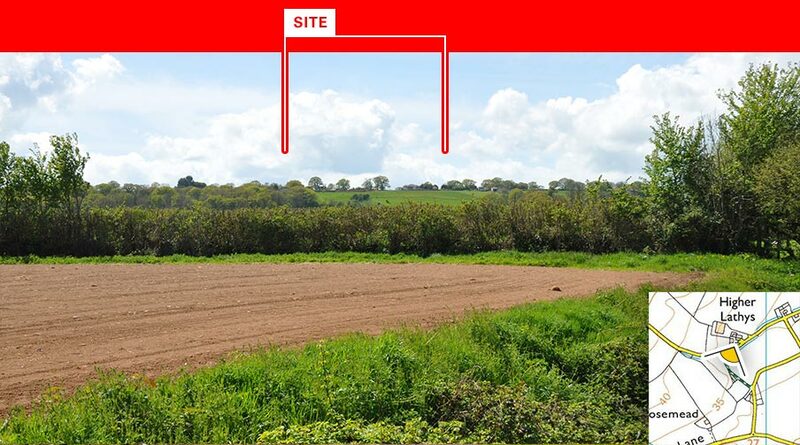 Despite the presence of one new dwelling within the site it is considered that, with the proposed mitigation and enhancements, there will be a moderate-major beneficial impact on the ecological value of the site due to the presence of a diversity of new valuable habitats (Devon hedgebanks, open swales and wetland, species rich grassland, native tufted grassland, native tree and shrub planting, green roofs, new roosting and nesting opportunities for bats, birds and hedgehogs). 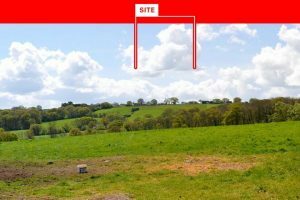 The site falls within character type 3a upper undulating farmed and wooded slopes and the following is of relevance to the application site and its immediate context. Undulating sloping land on greensand below the steep wooded scarp, where deciduous woods and copses on the upper valley slopes grade to pastoral/mixed cultivation, with some arable cultivation along the lower edge, especially in the southern part of this type. An intricate mix of small to medium fields with irregular boundaries of very wide earth banks with low, species-rich hedges and many trees, creating a well-treed and intimate character. Oak and ash are the most prominent species. Upper stream valleys are often steep and V-shaped, without a distinct valley floor, but with wetland along streams and in patches throughout. The settlement pattern is of isolated farms and occasional large houses, with some deserted farmsteads and small villages linked by very narrow winding lanes. Red brick and stone are often used in dwellings, with rusty corrugated iron roofs to stone farm buildings (these would formerly have had slate, clay tile or thatch roofs). There is little 20th century development, although such development does occur in close proximity to the application site. Occasionally this type occupies the slopes immediately below the plateau, but it is less steep and less wooded than the scarp slopes. The feeling of remoteness is strengthened by lack of settlement and limited views out, where vegetation acts as a screen or filter. Encouraging the conservation of hedgerow trees by planting or tagging selected saplings, to maintain and enhance the well-treed character of this type. Promote the biodiversity benefits of less intensive management and raise awareness of the potential damage from fertiliser run-off or spray. Encouraging the retention and management of existing field boundaries to maintain the mixed pattern of small to medium fields. Encouraging management via appropriate grazing regimes to control scrub and maintain unimproved grassland, flushes and wildflower meadows. Improving integration of 20th century development within the wider landscape, especially by replicating the distinctive treed earth banks and small woods of this Landscape Character Type. The soil naturally occurring on the site is slightly Acid Loamy Clayey, with impeded drainage. (Source: Landis Soil Portal – Cranfield University). 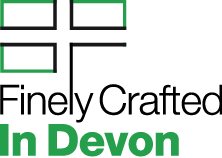 The Devon Hedgerow Group interactive map, shows that the site fall into the distinctive category of Elm dominated hedgerows, on turf faced banks. 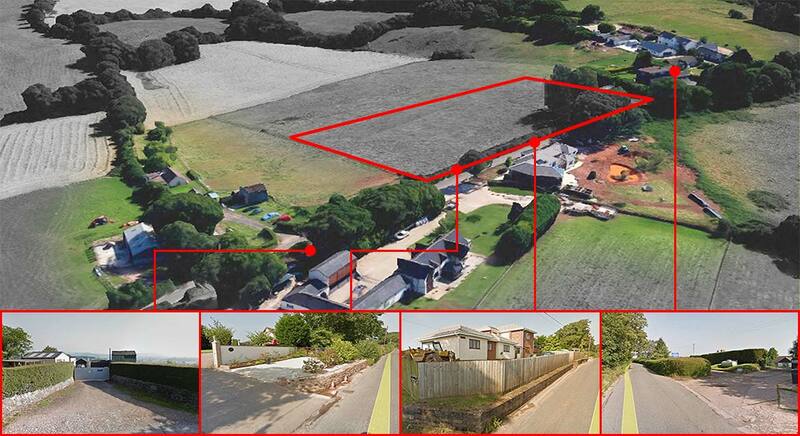 The site boundaries clearly need some native hedgerow planting – that in itself would provide enhancements as three of the boundaries are currently timber fences. Native hedge banks would be even better and you could have wildflower seeds on the bank (south facing it could be called a pollinator bank) and native woody species on top. On site the semi-improved grassland is relatively diverse as it has not been managed for quite a while – it would be good to use a wildflower mix or similar in the grassland areas on site rather than an amenity grass mix. 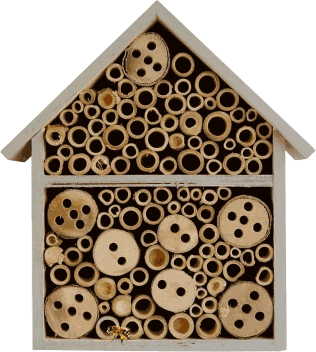 Other enhancements to be considered are water features which are allowed to colonise naturally, bee hotels, hedgehog boxes and reptile hibernacula. Sensitive lighting is also important for biodiversity. There are no mature trees on site so no other options for the placement of bat and bird boxes. Consider incorporating swift boxes and bat tiles on the building. Hux Shard is a robust, truly outstanding, site specific response of the highest architectural standards. The project significantly enhances its immediate setting through thoughtful and considered design. There is potential to be not only sensitive to the defining characteristics of the area, but also contribute to the vibrancy and longevity with future building trends.